Every week, it seems, there’s an announcement of a new major real estate development in Canada, and international names are attached to some of the most ambitious of these developments. 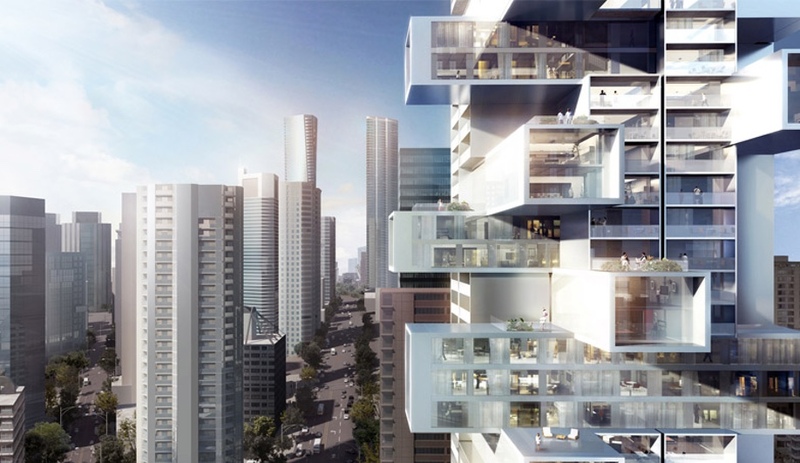 In fact, while BIG and 3XN are poised to transform entire neighbourhoods in Toronto, Kengo Kuma and Ole Scheeren are reinventing the skyscraper typology in Vancouver. 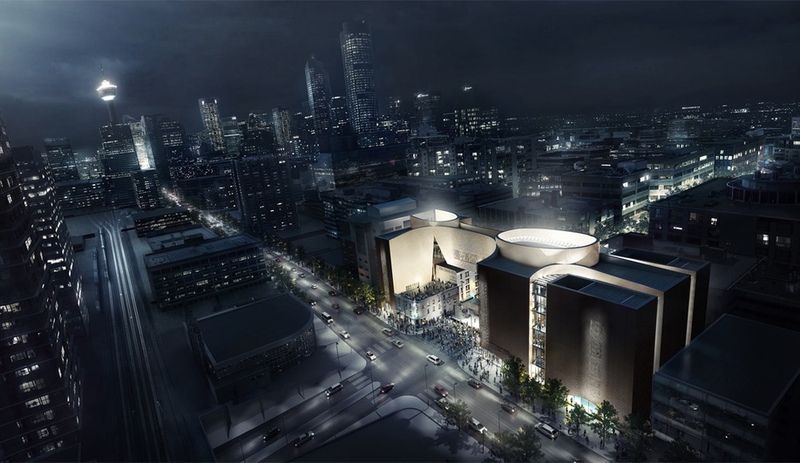 This is in addition to a number of major projects already underway and almost complete: NADAAA’s Spadina Crescent development for the University of Toronto’s architecture school; Allied Works’ National Music Centre, set to open in October; and OMA’s expansion to the Musée national des beaux arts du Québec, which is receiving its final touches. 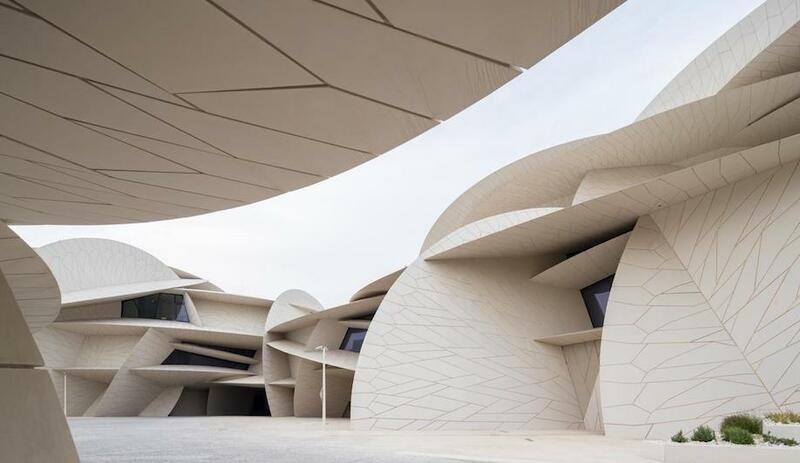 Here’s a look at five major projects across the country, all by international architects, that we’re looking forward to. 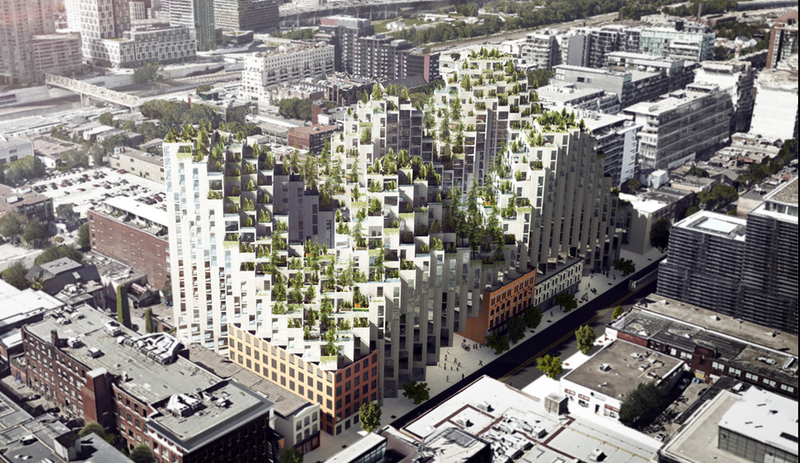 If all goes according to rendering, BIG will create a ziggurat on King Street West, one of Toronto’s most rapidly changing and upwardly mobile neighbourhoods. The concept, dreamed up for forward-thinking developer Westbank, has already captured the city’s imagination. The mountainous cascade of green-roofed apartments is also a wink and a nod to Montreal’s famous Habitat 67 by Moshe Safdie. 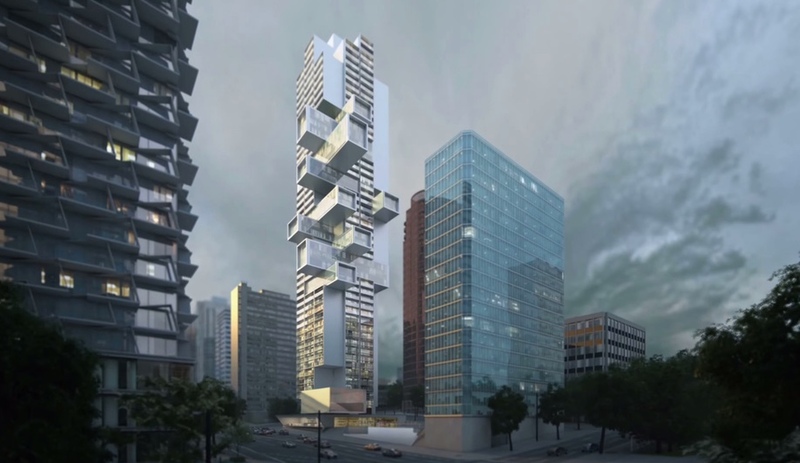 We’re just as excited by his Vancouver House, which straddles the elevated ramps of Granville Bridge; and the Telus Sky Tower in Calgary, another tower that staggers apartments to maximize views for each occupant. If you want to know what it’s like to live in a residential complex designed by BIG, The Infinite Happiness is a delightful documentary that looks at the lives of Copenhageners who call his 8 House home. 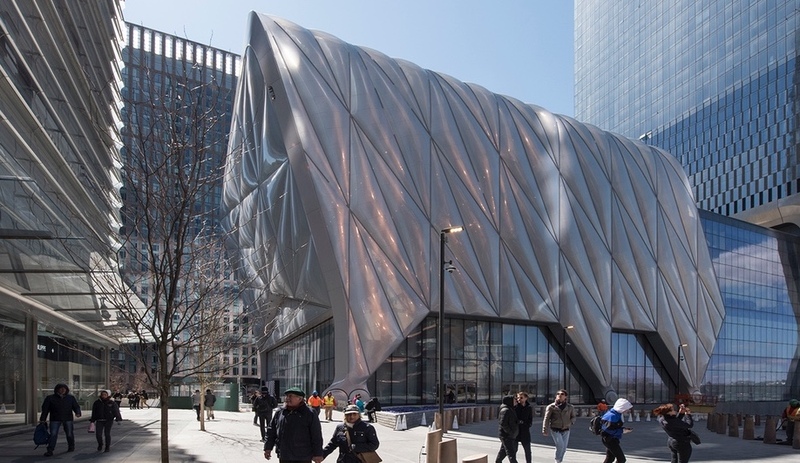 Not far from Ole Scheeren’s proposed tower, Kengo Kuma is creating another jaw-dropper. Its unique profile seems like the Japanese architect took a knife to his tower, and gently carved it on both sides, creating scalloped facades on the northeast and southwest sides to create a sense of spatial balance – and accommodate a series of open gardens. 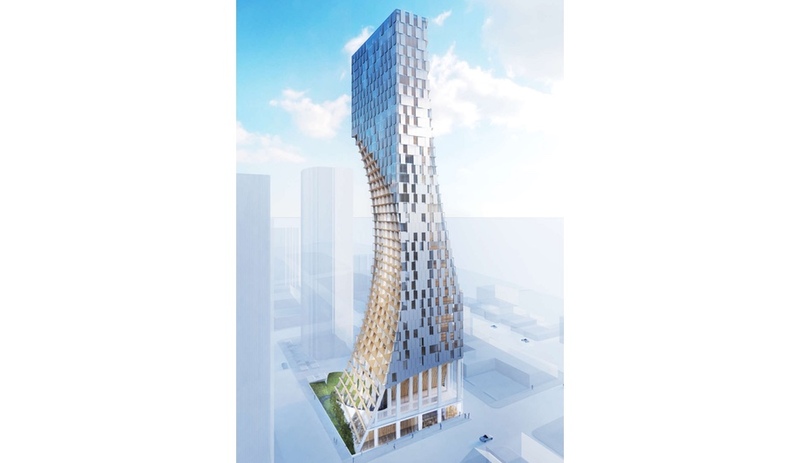 Conceived for 1550 Alberni Street, at the entrance of Stanley Park in the West End, the 40-storey project will be clad in glass and anodized aluminum, and will feature interiors with lots of bamboo. At the ground-level, there will be a Japanese moss garden, with water features and an amphitheatre-like plateau. 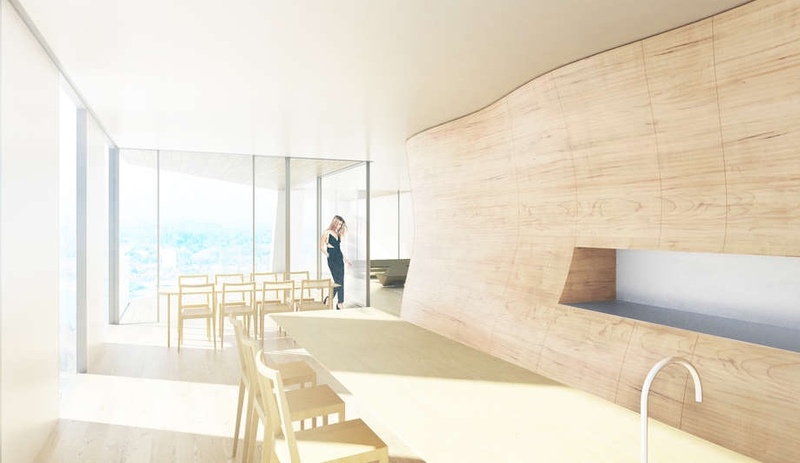 Kuma’s first tall building in North America is being developed by Westbank (with Peterson). This monumental project, by Portland, Oregon’s Allied Works and local partner Kasian Architecture and CANA Construction, is composed of nine glazed terracotta towers inspired by grain elevators, organ pipes and Alberta’s phenomenal hoodoo rock formations. 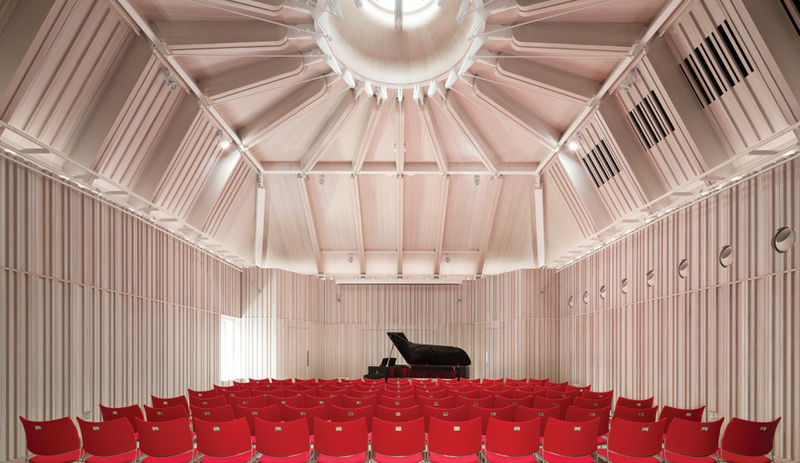 They will house a museum, a performance venue, a recording studio and a broadcast facility. The project, which won a 2013 AZ Award when it was introduced as an unbuilt competition concept, also restores and incorporates the 1905 King Edward Hotel under a dramatic swooping walkway that is the project’s most daring feature. 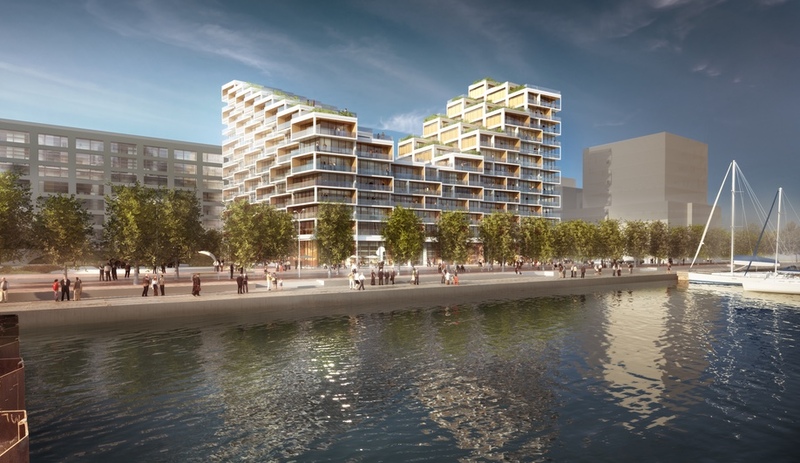 Besides BIG, another major Danish firm feels that Toronto condos could use more space, views and verdant canopies. The result of a design competition by real estate firm Hines and developer Tridel, 3XN’s proposal for the Queens Quay East development on Toronto’s waterfront is a zig-zagging, L-shaped complex that provides every inhabitant a view of the water, and lets natural light filter down to the public areas on the ground level. 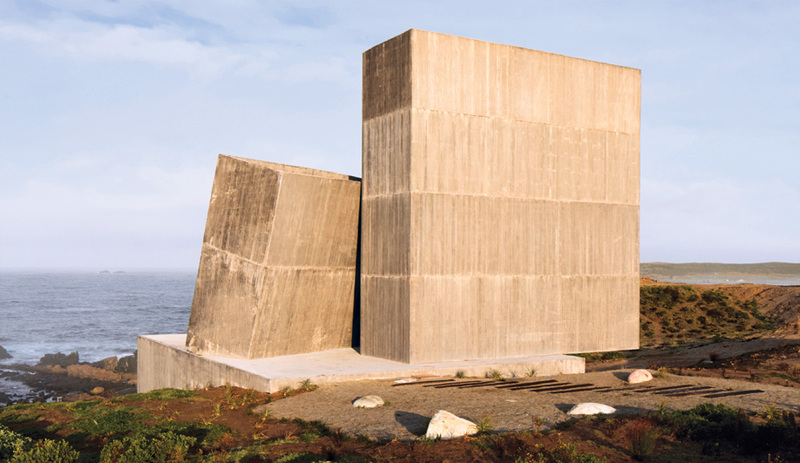 The firm will work with Toronto’s Kirkor Architects to realize the vision.